To maintain the vigor and production of your strawberry plants, you may want to utilize a strawberry transplanting system. By transplanting strawberry plants to new strawberry beds each year, you can maintain three (or more) vigorous, well-producing beds. The steps below can be modified to allow the strawberry plants to fruit for additional years or fewer years as desired. By not transplanting each year, you can maintain the cycle with fewer strawberry beds. If you ordered strawberry plants online or bought them from a local nursery and planted them in the spring, the strawberry bed likely won’t be established and into “Fruiting Year 1” until the following spring. At the end of the first fruiting year (the first year of the strawberry transplanting cycle), transplant several of the healthy, well-established strawberry runner plants to a new bed (bed 2) in the fall. Take care of your beds and winterize them as described on the Growing Strawberries page (link above). 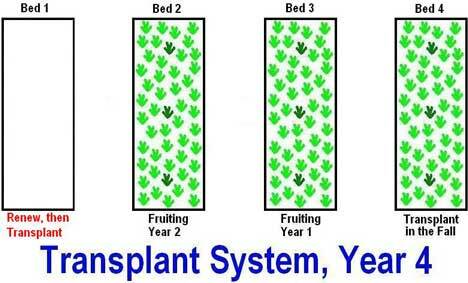 In year two of the system, the transplant strawberries in bed 2 will produce runners during their first fruiting year. The strawberry plants in bed 1should produce a good crop as the strawberry plants will be in their second fruiting year. You may need to thin the runner strawberry plants in bed 1 if they become too thick. In the fall, transplant strawberry runner plants from bed 2 to a new bed (bed 3). Overwinter all beds again. Bed 1 is now in its third production year. It is likely that these old plants will begin losing their productive capability soon. Beds 2 and 3 should also provide ample harvests. In the fall, transplanting strawberries occurs again. Following the same pattern, runner plants from bed 3 are transplanted into bed 4 in the fall. Also in the fall of year 3 after the strawberry plants in bed 1 have completely finished producing strawberries, they should all be removed. After removing, the renewal process should begin and continue into year 4. The strawberry plants in bed 1 should have been removed after they were completely done producing fruit in year 3. As soon as that occurred, bed renewal should begin. Rich organic compost, aged manure, or other soil enhancers should be generously added and tilled in. Either organic or non-organic fertilizers can be added as well. Add rich organic matter 2-3 more times over the course of the spring and summer months of year 4. In year 4, beds 2, 3, and 4 will produce a harvest while bed 1 is being renewed. 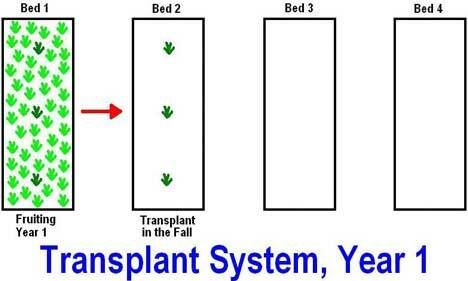 In the fall of year 4, transplant healthy runner plants from bed 4 back to bed 1. As long as your plants remain disease-free, this system should provide ample harvests from three beds from strawberry plants in their prime production years. By re-planting in the same beds, you do have an increased risk of your strawberry plants succumbing to one of the various strawberry plant diseases (reference the Strawberry Plant page at the link above for more details). 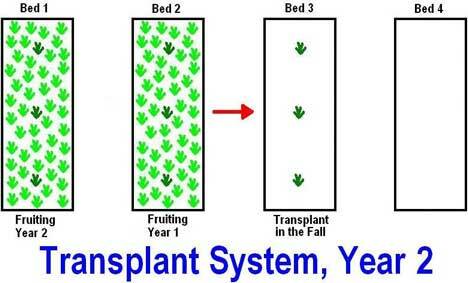 Once the transplant runner plants are in bed 1 again, the cycle restarts. Barring disease and assuming sufficient nutrients are re-introduced and combined with the soil to properly nourish growing strawberry plants, this system should theoretically sustain a 3-bed berry harvest indefinitely. The size of the beds are limited only by the gardener’s ability to maintain them! Hopefully this guide to strawberry plant transplanting has helped you. You should now know why you should transplant strawberry plants, when you should transplant strawberry plants, how you should transplant strawberry plants, and that it is usually best to transplant strawberry runner plants that are young and healthy. If you need extra help remembering which plants are old and which are runners within a bed, you can always use the cheap white plastic label stakes or Popsicle sticks to mark individual strawberry plants. 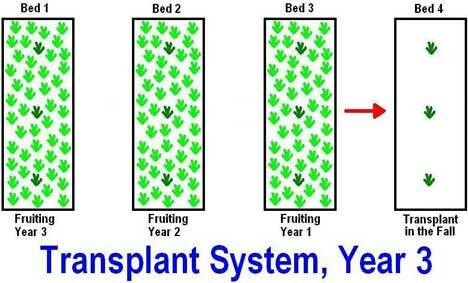 Hopefully, the strawberry transplanting system described will help accomplish your strawberry producing goals as well. Good luck, and happy transplanting!